I would like to receive occasional information and updates from Restart Rugby Weekend 2018 and jumblebee. 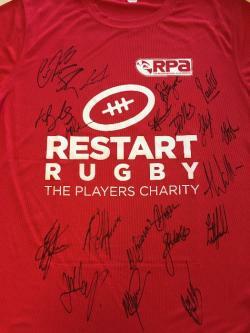 Round 20 of the Aviva Premiership (13th - 15th April) is dedicated to Restart Rugby, the official charity of the Rugby Players’ Association, with the aim of raising over £10,000 to help current and former players suffering from serious injury, illness or hardship. Take a look at our new film, featuring players we've helped, to hear more about the work we do to support players. Bid on exclusive signed memorabilia in our online auction. 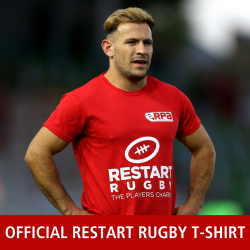 Or buy your official limited edition Restart Rugby #LiftTheWeight t-shirt as worn by players in their warm ups over the weekend. There's something for every rugby fan and all funds raised will help support our players when they need us most. Thank you. 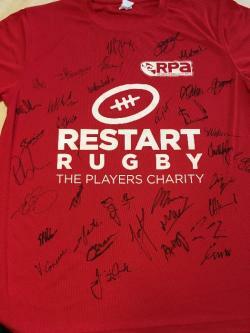 Follow us on Twitter @RestartRugby and show your support. Official replica home playing shirt, signed by the 2017/18 Bath Rugby squad. 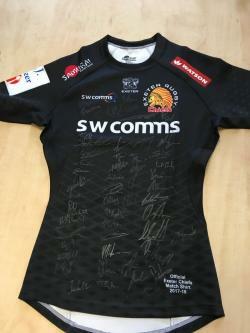 Official replica home playing shirt, signed by the 2017/18 Exeter Chiefs squad for Restart Rugby Weekend 2018. 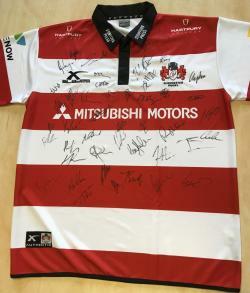 Official replica home playing shirt, signed by the 2017/18 Gloucester squad. 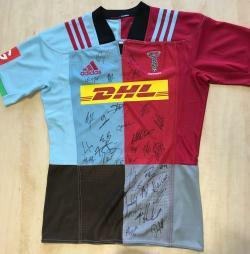 Official replica home playing shirt, signed by the 2017/18 Harlequins squad for Restart Rugby Weekend 2018. 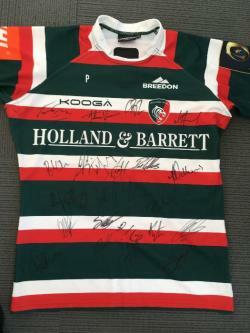 Official replica home playing shirt, signed by the 2017/18 Leicester Tigers squad for Restart Rugby Weekend 2018. 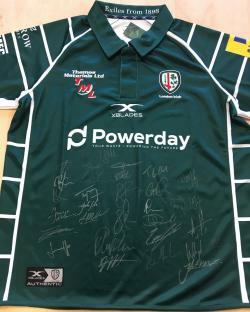 Official replica home playing shirt, signed by the 2017/18 London Irish squad for Restart Rugby Weekend 2018. The Aviva Premiership Rugby Final is a sensational day of top-class rugby at Twickenham Stadium. Watch the best two club sides in England battle for the honour to be crowned Aviva Premiership Rugby Champions. The prize is for two category two tickets with a face value of £65 each. 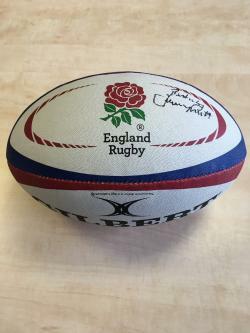 An official England ball signed by Bath, England and British and Irish Lions legend, Jeremy Guscott. 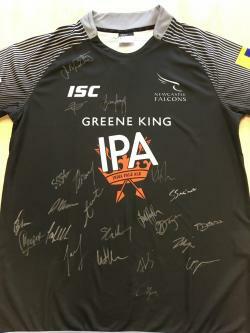 Official replica home playing shirt, signed by the 2017/18 Newcastle Falcons squad for Restart Rugby Weekend 2018. 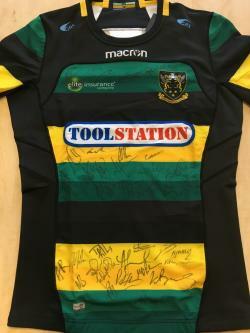 Official replica home playing shirt, signed by the 2017/18 Northampton Saints squad for Restart Rugby Weekend 2018. 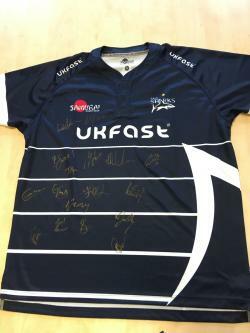 Official replica home playing shirt, signed by the 2017/18 Sale Sharks squad for Restart Rugby Weekend 2018. 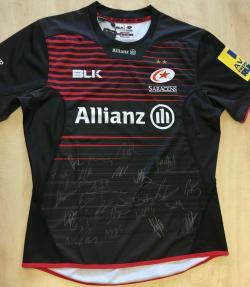 Official replica home playing shirt, signed by the 2017/18 Saracens squad for Restart Rugby Weekend 2018. Official England shirt signed by the winning 2017 RBS 6 Nations squad. The shirt is framed with a presentation plaque and comes with certificate of authentication. 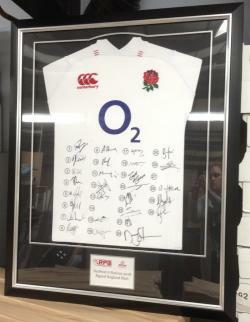 England shirt signed by the 2018 England 6 nations squad. The shirt is framed with a presentation plaque and comes with certificate of authentication. 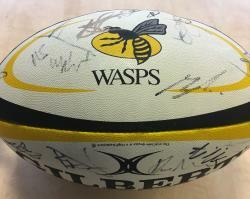 Official Wasps ball, signed by the 2017/18 Wasps squad for Restart Rugby Weekend 2018. 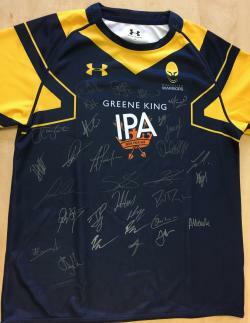 Official replica home playing shirt, signed by the 2017/18 Worcester Warriors squad for Restart Rugby Weekend 2018. 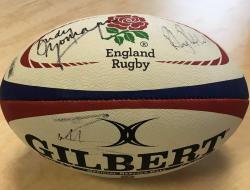 An official England rugby ball signed by England Scrum Half Andy Gomarsall, Mike Brown (Harlequins and England) and Rhys Priestland (Wales). 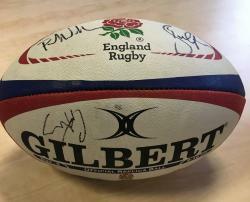 An official England rugby ball signed by Ben Youngs and Paul Wallace at the NatWest 6 Nations England vs Ireland game at Twickenham on 17th March 2018. 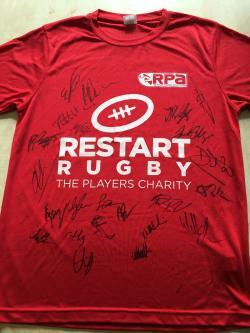 Also signed by England players George Kruis, Ben Te'O and Joe Launchbury after the game. 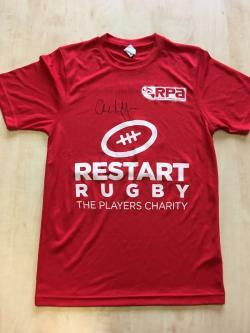 Limited ediition (1 of 4) Restart Rugby t-shirt signed by Saracens, England and British & Irish Lions legend, Charlie Hodgson. 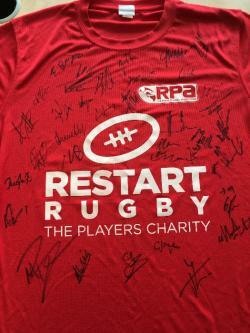 Limited edition (1 of 3) Restart Rugby #LiftTheWeight t-shirt, signed by the 2017/18 Harlequins squad for Restart Rugby Weekend 2018. The t-shirts are as worn by the players in their warm up for their match on Saturday 14th April. 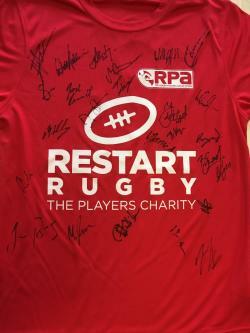 Limited edition (1 of 2) Restart Rugby #LiftTheWeight t-shirt, signed by the 2017/18 Eng;land Men 7s squad for Restart Rugby Weekend 2018. 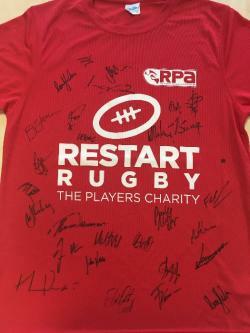 Limited edition (1 of 2) Restart Rugby #LiftTheWeight t-shirt, signed by the 2017/18 Wasps squad for Restart Rugby Weekend 2018. The t-shirts are as worn by the players in their warm up for their match on Saturday 14th April. 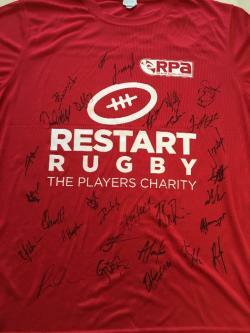 Limited edition (1 of 2) Restart Rugby #LiftTheWeight t-shirt, signed by the 2017/18 Northampton Saints squad for Restart Rugby Weekend 2018. The t-shirts are as worn by the players in their warm up for their match on Saturday 14th April. 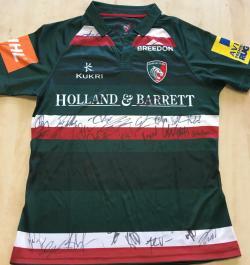 Official replica home playing shirt, signed by the 2016/17 Leicester Tigers squad for Restart Rugby Weekend 2017. 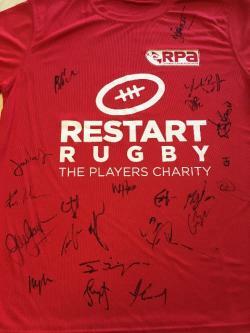 Limited edition (1 of 2) Restart Rugby #LiftTheWeight t-shirt, signed by the 2017/18 Gloucester Rugby squad for Restart Rugby Weekend 2018. The t-shirts are as worn by the players in their warm up for their match on Saturday 14th April. 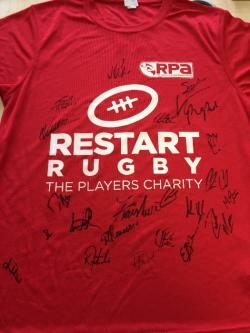 Limited edition (1 of 2) Restart Rugby #LiftTheWeight t-shirt, signed by the 2017/18 Saracens squad for Restart Rugby Weekend 2018. The t-shirts are as worn by the players in their warm up for their match on Saturday 14th April. 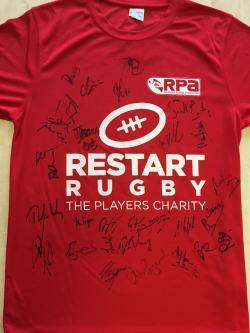 Limited edition (1 of 2) Restart Rugby #LiftTheWeight t-shirt, signed by the 2017/18 Sale Sharks Rugby squad for Restart Rugby Weekend 2018. The t-shirts are as worn by the players in their warm up for their match on Friday 13th April. 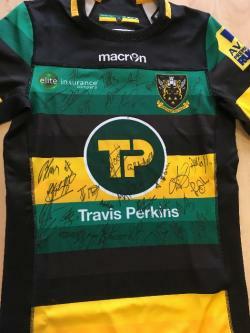 Official replica home playing shirt, signed by the 2016/17 Northampton Saints squad for Restart Rugby Weekend 2017. 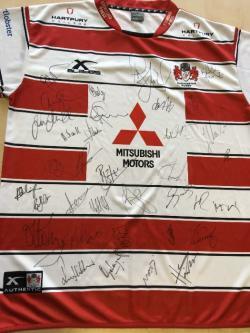 Official replica home playing shirt, signed by the 2016/17 Gloucester squad for Restart Rugby Weekend 2017. Saracens legend Mauritz Botha, 100 Club playing shirt, signed by the 2014/2015 Saracens squad. Limited edition (1 of 2) Restart Rugby #LiftTheWeight t-shirt, signed by the 2017/18 Worcester Warriors squad for Restart Rugby Weekend 2018. The t-shirts are as worn by the players in their warm up for their match against Wasps on Saturday 14th April. Limited edition (1 of 2) Restart Rugby #LiftTheWeight t-shirt, signed by the 2017/18 Bath Rugby squad for Restart Rugby Weekend 2018. 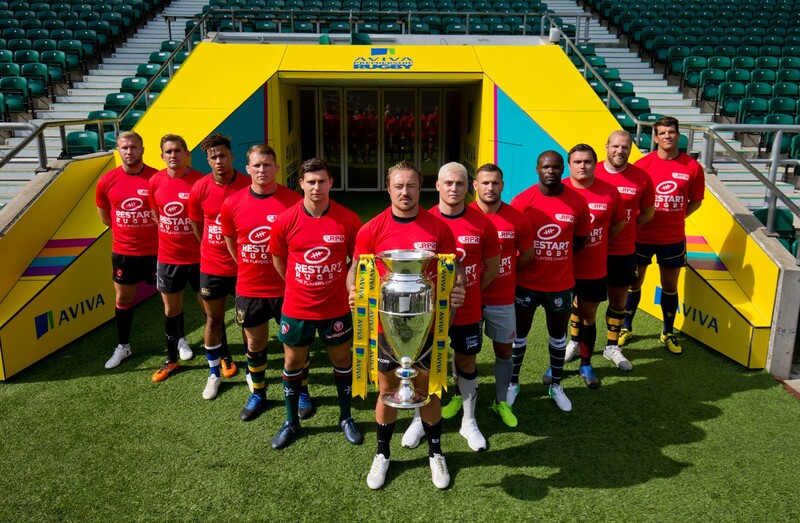 The t-shirts are as worn by the players in their warm up for their match against Saracens on Sundday 15th April. Limited edition (1 of 2) Restart Rugby #LiftTheWeight t-shirt, signed by the 2017/18 Newcastle Falcons squad for Restart Rugby Weekend 2018. The t-shirts are as worn by the players in their warm up for their match on Friday 13th April.